How do psychoanalysts explain human morality? Guilt and Its Vicissitudes: Psychoanalytic Reflections on Morality focuses on the way Melanie Klein and successive generations of her followers pursued and deepened Freud's project of explaining man's moral sense as a wholly natural phenomenon. With the introduction of the superego, Freud laid claim to the study of moral development as part of the psychoanalytic enterprise. At the same time he reconceptualized guilt: he thought of it not only as conscious, but as unconscious as well, and it was the unconscious sense of guilt that became a particular concern of the discipline he was founding. As Klein saw it, his work merely pointed the way. Judith M. Hughes argues that Klein and contemporary Kleinians went on to provide a more consistent and comprehensive psychological account of moral development. Hughes shows how Klein and her followers came to appreciate that moral and cognitive questions are complexly interwoven and makes clear how this complexity prompted them to extend the range of their theory. Hughes demonstrates both a detailed knowledge of the major figures in post-war British psychoanalysis, and a keen sensitivity to the way clinical experience informed theory-building. She writes with vigor and grace, not only about Freud and Klein, but also about such key thinkers as Riviere, Isaacs, Heimann, Segal, Bion and Joseph. 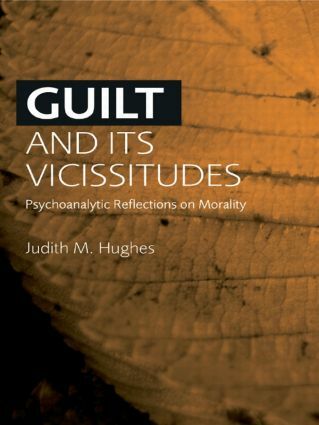 Guilt and Its Vicissitudes speaks to those concerned with the clinical application of psychoanalytic theory and to those interested in the contribution psychoanalysis makes to understanding questions of human morality.